I am very grateful to Mrs G Oliver for giving me a copy of the booklet and for discussing the company with us. Are there any still in use? 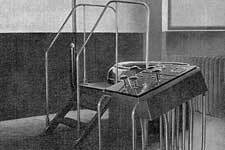 Turbulayr Products Ltd was a Granton-based company, set up by Professor William Oliver, that made stainless steel products. 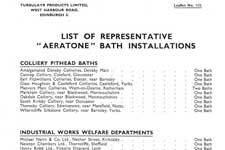 They operated from about 1938 to 1953, and their best known product was the Aeratone bath. Some of these are still in use although the last one was made in the 1950s. 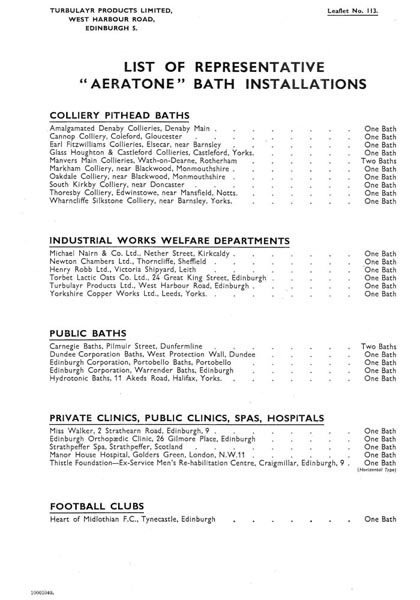 The company operated from premises that they described as West Harbour Road, but which the Edinburgh and Leith Post Office Directory described as Shore Road, Granton. The premises were located near the Northern Lighthouse Board depot. Professor Oliver was an engineer and a part-time professor at the University of Edinburgh. 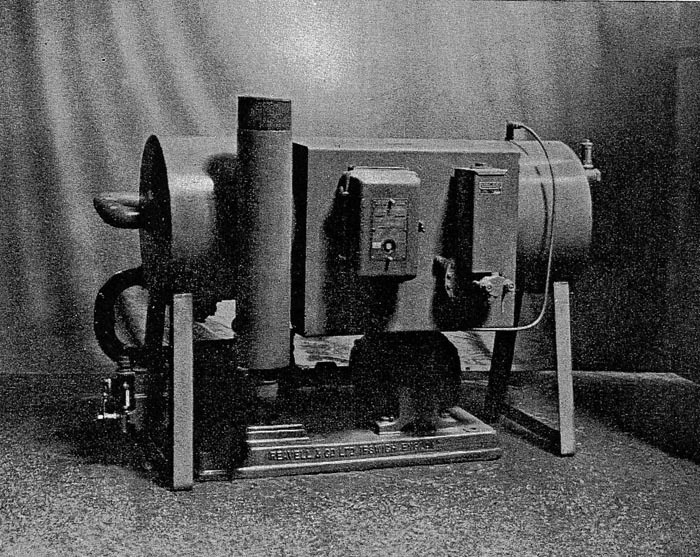 Part of the funding for the company came from Sir Donald Pollock, also associated with the University of Edinburgh. They both lived near to Turbulayr’s premises. The fire extinguisher was invented during World War II and was intended for dealing with incendiary bombs, even if no water supply was available. 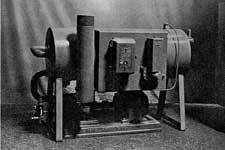 Steel has a long history, but mass production was not possible until the nineteenth century, after Henry Bessemer devised the ‘convertor’, patented in 1855. Steel consists of iron (symbol Fe) with smaller quantities of other elements, which make it stronger in tension – in other words when stretched or bent – than pure iron. But it is prone to rusting when it becomes wet. 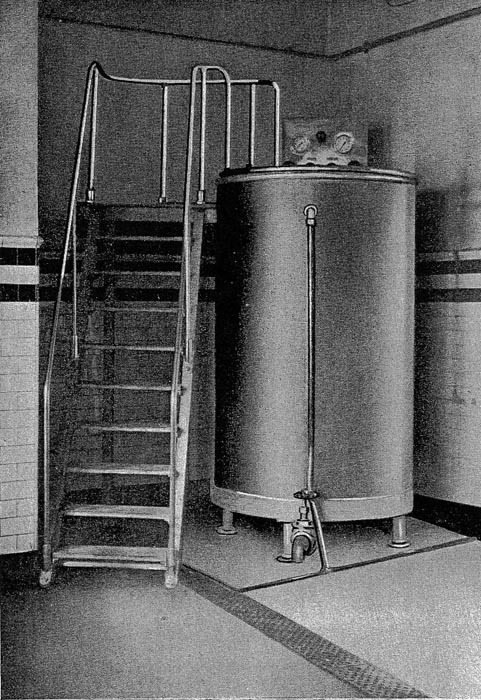 After many experiments, stainless steel was devised in the early part of the twentieth century. The date is often given as 1913. In addition to iron it contains Chromiuim (Cr) and other elements, which give it very much better resistance against rusting and attack by various chemicals. 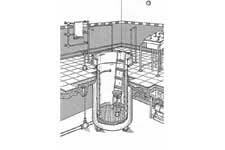 The bath consisted of a stainless steel cylinder 6 feet (1.8 metres) high and 3 feet 5 inches (just over 1 metre) in diameter. Inside was another slightly smaller stainless steel cylinder, which was perforated. 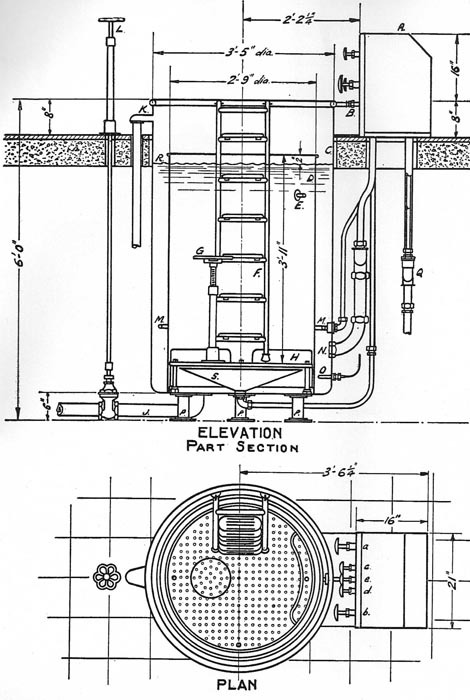 Compressed air was blown into the bath between the two cylinders and aerated the water with small bubbles. 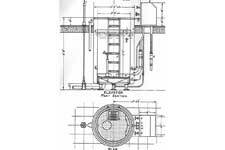 The air supply was controlled by valves. The recommendation was to have the water just above body temperature. Around the rim was a perforated tube which could give a refreshing spray of cold water from fine jets. 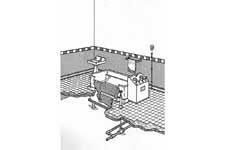 The preferred way to install the bath was to support it on a floor below the level that it was accessed from. 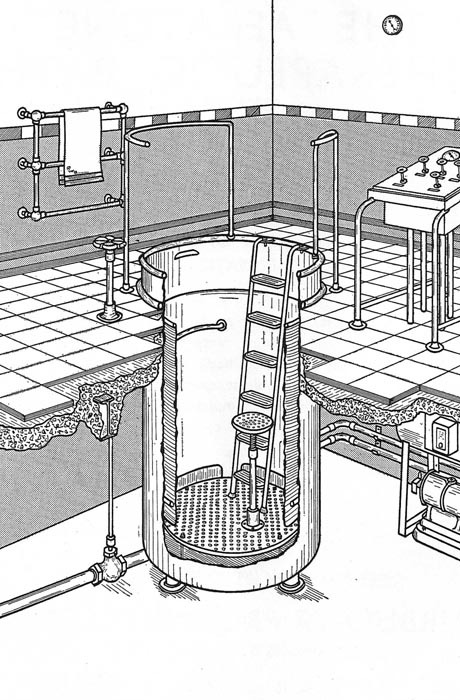 The electric compressor and air reservoir that were required to operate the bath could also be installed on the lower level. 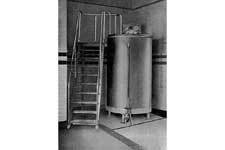 It was also possible to have the bath free-standing above floor level, with a ladder for users to enter it. 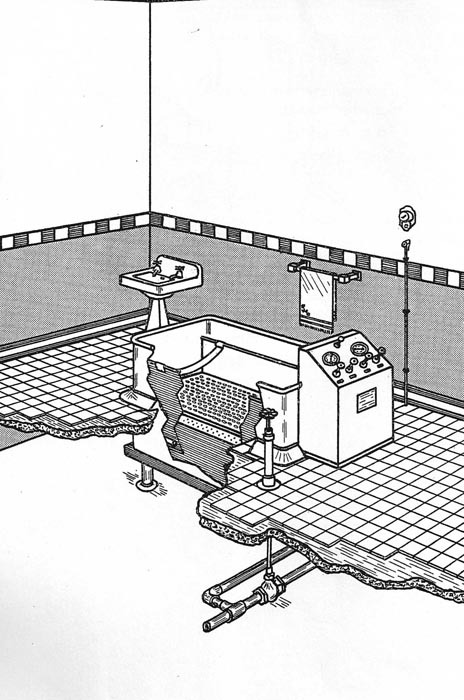 An alternative design was also available, for a horizontal bath. 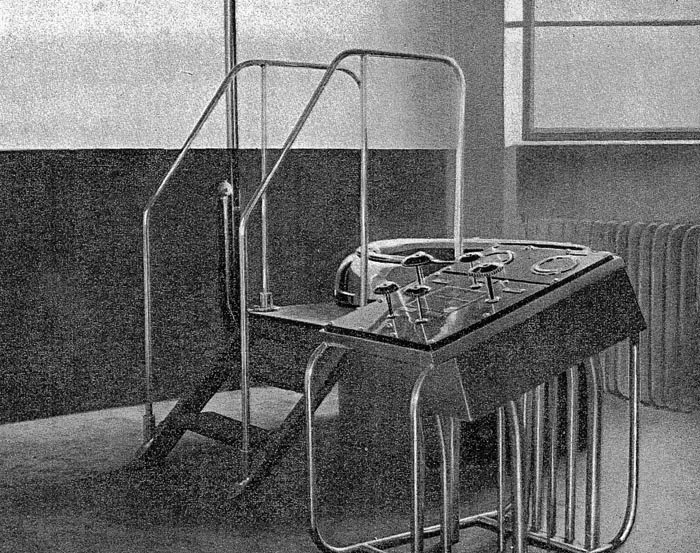 These views show some different arrangements, the first with the controls located so that the user could operate them and the third with controls for operation by an attendant. 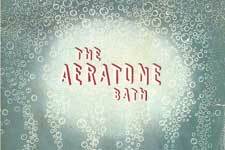 The following film clip shows an Aeratone bath in use. 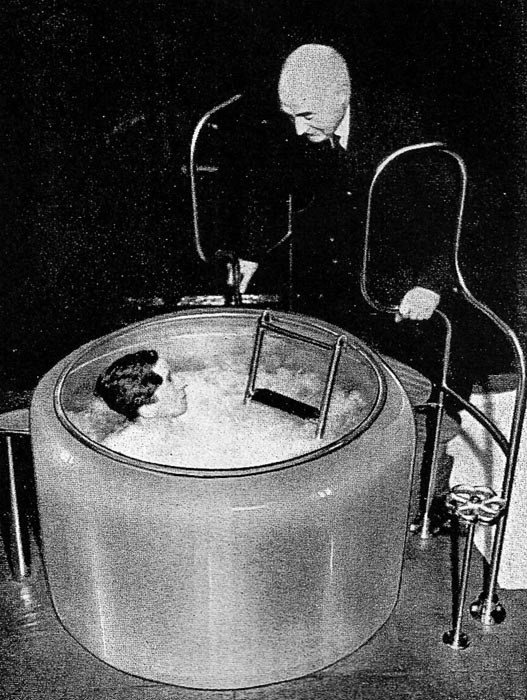 British Pathe movie clip(1954) showing Aeratone bath in use at the White House, a luxury hotel in London. 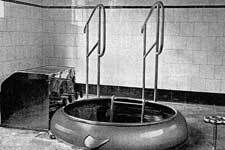 In the Edinburgh area, there was a bath – still there – at Portobello Baths (now Portobello Swim centre), installed in June 1939 and one at Warrender Baths. 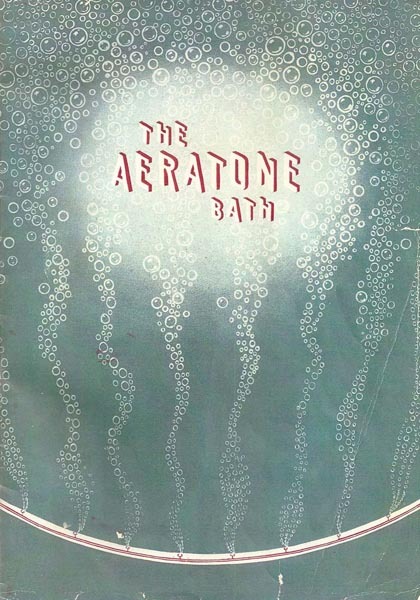 Aeratone baths are still in use at a number of locations, despite the last one having been made in the 1950s. Locally, this includes Portobello Swim Centre where an Aeratone bath was installed in June 1939. One that has received greater publicity recently was at Victoria Baths, Manchester. These baths had fallen into disrepair but are being restored with funding from English Heritage and the A6 Partnership. 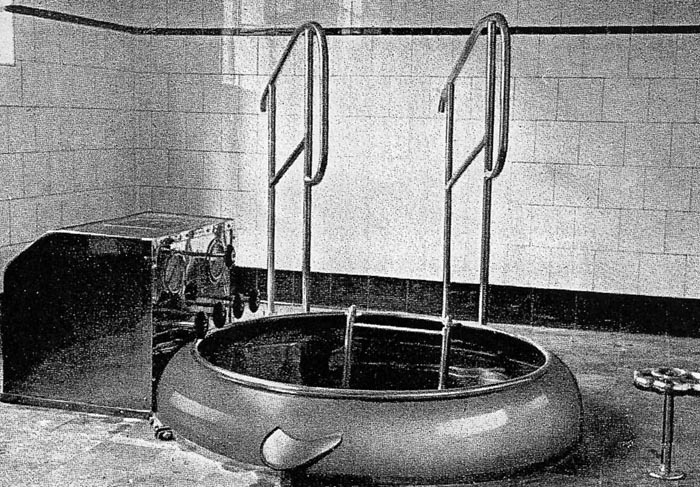 The Aeratone bath there was installed in 1952. Turbulayr Ltd seem to have gone out of business about 1954. Professor Oliver was then approaching seventy years of age and had retired from the University of Edinburgh in 1953. A new product was launched about the same time in the USA, which worked on a different principle, using jets of water rather than compressed air to give a therapeutic effect. 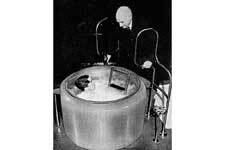 It was manufactured by the Jacuzzi company, was promoted on TV, and became a well-known name. There is more information on other pages. For more information about the people involved with the company, please click on the following links.